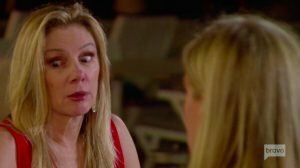 Ramona Singer Apologizes For Saying Dennis Shields Was "Not Smart" Because "He Was On Drugs"
What did Bethenny think when she watched that scene? Did someone tell her about Ramona’s remarks while they were filming the season? If not, she’s going to come for Ramona during the reunion taping. For sure. Bethenny once eviscerated Ramona for not saying hello to her assistant in the elevator. Imagine how deep she’s going to bury Ramona for this remark. Wow, wow, wow, Ramona. Just wow. The fans are all for the Housewives throwing shade and coming for each other, but this remark was at another level of insulting. Will Ramona’s attempt to save face apology actually make up for this one? TELL US- WHAT DID YOU THINK OF RAMONA’S COMMENT ABOUT DENNIS WHEN YOU WATCHED THE EPISODE? DO YOU THINK RAMONA IS GENUINELY SORRY FOR WHAT SHE SAID? HOW WOULD YOU FEEL IF YOU WERE BETHENNY FRANKEL AND SAW THE EPISODE?